A great way to use up your slightly stale bread! 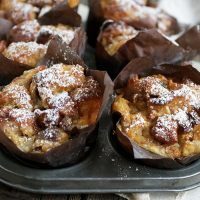 About 1/2 a loaf is perfect for making 6 delicious bread pudding muffins. Add raisins or other dried fruit, if you like. Great for desserts, snacks or a sweet, breakfast treat. Place cubed bread into a large bowl and toss with cinnamon. In a medium bowl, whisk together the eggs, sugar, cream and milk. Pour over the bread cubes. Stir in raisins or dried fruit, if using. Cover bowl with plastic wrap and refrigerate for at least 2 hours or up to 24 hours. Preheat oven 325 F. (160 C.) Line a 6-cup muffin tin with paper liners (or generously grease with butter). Scoop a heaping 1/2 cup of the pudding mixture into each of the 6 muffin cups (each one should be nicely mounded. Top off each muffin cup with any remaining liquid. Bake for 40-45 minutes, rotating the muffin tin 180 degrees about half-way through baking. Muffins should be lightly golden brown on top. Dust with confectioners' sugar while they're still warm.